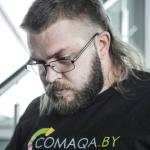 Activist of QA Automation COMAQA.BY, low level Development C/C++ CoreHard.BY, IT specialists, moved to Belarus from other countries InterIT.BY communities, co-founder of DPI.Solutions, manager at EPAM Systems. More than 15 years of experience in IT. Specializes in low-level development, QA automation, management, trainings, and sales.